Recently made, invented, produced, or come into being; lately discovered or experienced; unfamiliar; recently brought into a particular location, situation, condition, or relationship; not habituated or accustomed; never in existence or use before; novel; starting afresh; different from a former or older condition; replacing something older; fresh; repeated; modern, contemporary; refreshed, strengthened. This term sometimes denotes all persons whatsoever who may have, claim, or acquire an interest in the subject-matter; as in saying that a judgment in rem binds "all the world". A mandate, precept; a command or direction authoritatively given; a rule or regulation. The term New World Order has been used by numerous politicians through the ages, and is a generic term used to refer to a worldwide conspiracy being orchestrated by an extremely powerful and influential group of genetically-related individuals (at least at the highest echelons) which include many of the world's wealthiest people, top political leaders, and corporate elite, as well as members of the so-called Black Nobility of Europe (dominated by the British Crown) whose goal is to create a One World (fascist) Government, stripped of nationalistic and regional boundaries, that is obedient to their agenda. Their intention is to effect complete and total control over every human being on the planet and to dramatically reduce the world's population by two thirds. Subtitle: In a campaign designed to "reassure" the public that the police the mass transit bus company, and the Mayor of London were teaming together to fight crime, display billboards suddenly sprouted all over London that disturbed people, not reassure them. Is it possible that people are more aware of the Satanic symbolism of the Illuminati than leadership has thought? Or, is it possible that people are generally afraid of the all-pervasive surveillance and the spirit behind it? NEWS BRIEF: "London's Privacy Falling Down", by Julia Scheers, Wired Magazine, November 2, 2002. "Attention Londoners: Big Bobby is watching. That's the message of posters plastered along London's bus routes earlier this week to assuage riders' crime fears. But the posters are having the opposite effect on privacy advocates, who say the artwork is creepily reminiscent of the all-seeing authority described in George Orwell's 1984. The posters show a red double-decker bus crossing a bridge as four floating eyes stare down from the sky. 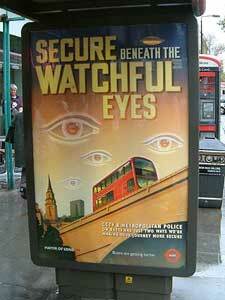 The eyes' pupils are the symbol of Transport For London, the city's mass-transit provider. As you can see from the picture of this billboard, above, these all-seeing eyes are quite startling. People are very disturbed by these signs, for a variety of reasons. First of all, no one likes the idea that every movement they make is being monitored by authorities, the message this billboard is communicating. In an effort to reassure the traveling public, the police, the mass transit company, and the mayor's office have teamed up to place heavy surveillance cameras and other sensing equipment on public busses. The public is expected to be reassured that no criminal would be able to easily commit a crime on these busses because they know they would be instantly -- and often -- recorded. The concept is similar to that of the lamppost in a neighborhood; studies have conclusively shown that lampposts in a neighborhood really do cut down crime, for as the Bible states, sin loves the darkness and hates the light. Secondly, some people believe that the pervasive cameras treat everyone like a criminal. Everyone is guilty until proven innocent by the all-seeing eye of the cameras. Listen: "There is a mentality that everyone is potentially a criminal," said Davies. "I resent the idea that I should be subjected to the scrutiny of invisible cameras just to satisfy someone's crazed idea of that way society is." Thirdly, the technology is rather easily defeated. The mechanical eyes -- which are frequently disguised -- are easily evaded by wearing baseball caps or other headgear. Thus, this campaign seemingly promises more than it can deliver. However, much crime probably is diverted by criminals, knowing they will have to devise a plan of crime that will not only accomplish the theft or the murder, but will do so in such a way that the perpetrators are not caught by the cameras. Many criminals are either not that smart or that brazen. From this and other events, we can see that the UK is involved with this. When I read this NWO stuff, one word comes to my mid, "Theocracy." The NWO could possibly be a form of theocracy, "do you think so?" Has there been sinificant evidence of theocracy forming in the US Government? I look forward to working with our new inbred fascistic overlords. The Illuminati are coming ! ! ! Oh Jeeze, Mildred, that Revere kid is at it again. I wish someone would steal that bike of his.